It’s time for yet again, another holiday gift list for runners. Each year these are splattered all over the internet, and I usually have the same things on my list as well. But this year I wanted to mix it up and be more creative. So if you know a runner these are some great things to put under the tree or in their stockings. And if you’re the runner, add these to your list pronto! Race entry-What’s the perfect way to show your runner that you support them? Pay for their registration into a race. While some races can be quite expensive, your gift can be as simple as a local 5k. Prices range from $15-150+ depending on how big the race or the distance. Nuun- With all of the holiday cheer you’ll be consuming over the holidays, your runner will need to make sure they stay hydrated. With three different formulas and over 20 flavors, Nuun is the perfect way to keep away the holiday hangover. Right now when you spend over $30, you get a free Nuun trucker hat with your purchase. Gift cards– Gift cards are always the easy way out, but sometimes they’re the best option. If you have a picky runner on your hands or maybe a runner who can’t decide on something, gift cards are the way to go. You can pick some up at your local running shop, your runner’s favorite online store, or the big box sports stores. Race Bib Coasters- Does your runner have a special race that they want to remember forever? Ellie has the perfect solution for you. Custom coasters with you or your runner’s race bib. I have a pair of my own and love them! These are the perfect gift to display your accomplishments, you can use them all year long and they never wear out! Winter safety kit– Winter can be a dangerous time for runners. With snow, cold and lack of daylight, it’s best to keep your runner safe as possible. Need a few ideas for a winter safety kit? Try: pepper spray/mace, Road ID, a reflective vest, head lamp, YakTrax and gloves. Bib/Medal holder– If you weren’t allowed to hang your medals on your Christmas tree, you may still need a place to display them. Running on the Wall has medal hangers, bib hangers and more. I received this one a few years ago, but it’s getting pretty full. Looks like I may need to add it to my list as well. 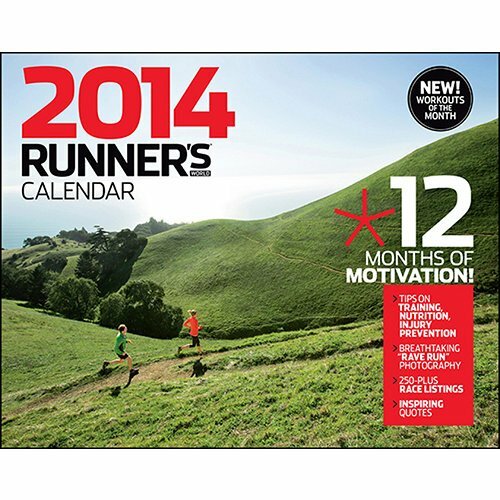 Runner’s World Calender- Want to know how you can keep your runner motivated through the day? Buy them the Runner’s World Calendar. I have both the wall calendar and daily boxed calendar in my office at work and love them. It’s a nice reminder to have all day when you’re ready to relax once you get home from work. So there’s my take on some creative gifts for the runner in your life. I have no doubt that if you pick any of these gifts, your runner will appreciate them!